Let us stick with the cask strength whisky but move south from the Speyside, all the way to Campbeltown: yes, it’s the Springbank 12 CS, the seventh release to be exact. This is a mix of first-fill and refill sherry casks (I’m not sure of the proportion). I’ve had some of the earlier batches, with the first batch (at 54.6%) my favourite. Again, that bottle was finished long before the blog and so I have no notes on it. 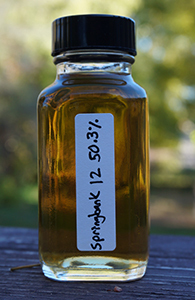 Despite the fact that they bottle a lot of sherried whisky Springbank doesn’t always come up when people ask for recommendations of sherried whiskies. This is partly because their more intensely sherried whiskies are quite expensive (see the 18 yo and the absurdly priced 21 yo) and partly because the more affordable ones emphasize the quintessential distillery character (brine, leather) over sherry for sherry’s sake. That has been my experience at any rate. Let’s see if this one supports that claim. Nose: Oh yes, I am a prophet. Leathery brine and briny leather. A little bit of orange peel and smoke and gunpowder below that. Everything gets more intense as it sits with some rubber emerging and a bit of dried apricot too. The gunpowder turns to struck matches and there’s more smoke too. With more time the rubber goes away and there’s a bit of cream and a little more toffee. With even more time the dried citrus and apricot expand quite a bit and there’s some mango leather too. Water is superfluous. Palate: As on the nose but with a lot more smoke (not medicinal at all, more minerally) and more of the leathery quality too. The dried orange peel comes up from below with some pepper, and there’s some Sichuan peppercorn and roasted cumin too. Not a whole lot more development but I’m not complaining. More apricot with time. Perfectly drinkable at 50.3%, and frankly this is not calling out for water at all, but in the interests of science let’s add some: well, it actually gives it a lot more bite—the citrus is sharper and it’s more peppery now (coarsely ground black pepper). Finish: Long. The dried orange peel expands and it gets sweeter before the brine and leather come back again. Apricot at the very end. As on the palate, much more peppery with water; but there’s also much more fruit here at the end: the apricot, yes, but also some mango. Comments: I love this profile: the interplay of citrus, pepper, leather and brine is quite unique, and especially in more smoky Springbanks, such as this one, (not always easily distinguishable from contemporary Longrows), really quite lovely indeed. If you’re a sulphur-phobe this is probably not for you though. Thanks to Patrick for the sample! This entry was posted in -Whisky by Rating, 85-89 points, Distillery, Springbank and tagged *Whisky, Campbeltown, Scotch, Sherried, Single Malt, Springbank 12. Bookmark the permalink. Ha. Oops! I can’t even coordinate socks this week, let alone whisky reviews. No other sherried reviews for me this month, so no more surprises. I split my sample into two different sessions, just to confirm my opinion of it, but found the second round less inspiring than the first. It’s not bad by any means. And I actually liked the sulphur quite a bit. My favorite Springbank since the Madeira cask, I think. “Leathery brine and briny leather” – brilliant line! I haven’t tried this one, but would like to. I do, however, own a bottle of the Gaja Barolo – which I really like. have you tried that one? If so, what are your thoughts? No, I haven’t tried the Gaja Barolo. As a general rule, I tend to stay away from red wine casks. Though as I say that I recall that I quite liked the Springbank claret wood and the Longrow Burgundy wood. And I see I’ve failed to review either. MAO, do you still have a sample of the Claret Wood kicking around that you might review, or is it lost to the mists of time? I do indeed—4 ounces from early in the bottle’s life. I’ll try to remember to put it on the docket for January or February. Ahhh, Patrick, the Madeira cask. That was a great whisky. Which is why I was so disappointed with the Longrow Madeira that came out a couple of years ago. I know K&L had a similar release but didn’t pull the trigger on that one. Currently drinking Batch 14 and it might be even better than this one was…Review coming soon.